When you think reptile, you think long, slithering, deadly creatures however not all reptiles align with this image. When you think reptile, you think long, slithering, deadly creatures however not all reptiles align with this image. Crocodiles may not exactly meet these characteristics but have similar attributes that make it a type of reptile. There is said to be thirteen types of crocodile species around the world. In Africa, the Nile Crocodile (or scientifically known as the Crocodylus niloticus) sits on the list of crocodiles that can be found in the beautiful continent. As the name “Nile crocodile” suggests, the reptile was originally found as far north as the Mediterranean coast in the Nile Delta and extended across to the Middle East side of the Red Sea in Israel and Syria. Unfortunately, the Nile crocodile is said to be extinct in these regions. Currently the crocodile is said to be found in large numbers across Sub-Saharan Africa. Countries where it can be commonly found include Ethiopia in the Lake Chamo region, Kenya in Lake Baringo, Mozambique, South Sudan, Botswana along the Okavango Delta, Central African Republic, Malawi, Egypt’s Lake Nasser, Gabon, Mozambique, Zambia, Zimbabwe, South Africa and Rwanda. Surprisingly, the Nile Crocodile is considered to be an “invasive species” in North America with multiple sightings of the crocodile in the region. It is known as a freshwater predator that lives in different types of aquatic environments especially if they are open and broad bodies of water. Nile Crocodiles are noted as being able to tolerate a broad range of environment types such as lakes, rivers, marshlands, brackish streams, swamps, tidal lakes and estuaries. Interestingly enough, there are small populations of the Nile crocodile that exist in Madagascar that are found in caves. One may wonder if the Nile crocodile possesses salt glands like other “true crocodiles”, such as the American crocodile and saltwater crocodile. The answer is yes; however, it is not a frequent visitor of the sea like its other counterparts, it only visits the coastal and marine waters in rare instances. Nile crocodile is a quadruped with four short, splayed legs, a long, powerful tail, a scaly hide with rows of hardened scutes (a bony external plate or scale overlaid with the skin of crocodilians) running down its back and tail, and powerful, elongated jaws. The African crocodile, as it is colloquially known, is a dark bronze reptile with shades of black spots and stripes that cover the back. The green-eyed reptile also has a yellowish belly and flanks with variation of dark patches of oblique stripes. There is a black banding across the body and tail which usually fades during adulthood. The appearance of this freshwater predator allows it to camouflage well in their aquatic environments. Their skin also carries integumentary sense organs that may react to changes in water pressure which allows them to track prey movements in water. The average length of a Nile crocodile is 3.5 – 5 meters long, making it the largest freshwater predator in the animal kingdom and the second largest crocodile. It has also been recorded to be 6 metres long in some instances. Research into the physical attributes of the Nile crocodile indicate that Nile crocodiles that are found in cooler climates, such as the Southern tip parts of Africa, are smaller and may only reach a maximum length of 4 metres. The adult female Nile crocodiles average a weight of 40 to 250 kilograms, while their male counterparts average between 150 to 700 kilograms. There was been Nile crocodiles found that weigh up to 1090 kilograms and exceeding a length of 6.1 meters. The average life span of a Nile Crocodile is 45 years. Their ability to camouflage and its massive weight, is possibly a large part of the the reason why they are one of the most dangerous predators with the ability to take on most animals within their habitual perimeter. Nile crocodiles are categorized as carnivorous animals. 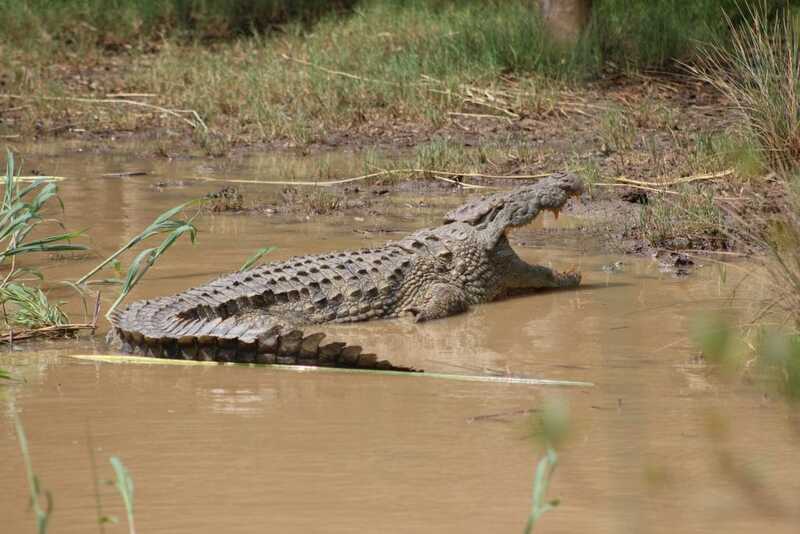 At a young age, Nile crocodiles are generally restricted to eating small aquatic invertebrates such as dragonflies, worms and leeches and other insects. Eventually, they start to eat vertebrates such as fish, amphibians and reptiles. As adults they are able to increase this list of food choices by taking on large vertebrates such as antelope, buffalo, young hippos and large cats. To access most of their water preys, the crocodile has been observed using their bodies and tails to corral the fish towards the water bank and pick it with their jaws. The species is also known to be scavengers and will travel from the water to land to feed off of dead carcasses. The timing of the nesting changes based on geographic region. In the north, breeding takes place during the dry season, however the start of the rain season is when breeding takes place in the South. Females reach sexual maturity around 2.6 metres and males at approximately 3.1 metres. Females, depending on geographical region, lay around 40-60 eggs in their nest. The nest is a 50-centimetre hole in sandy banks far from the water. Despite their aggressive nature to other animals, the Nile crocodile is said to be highly protective of their own especially in the breeding phase. The incubation phase is approximately 70 to 100 days. Female crocodiles are known to fiercely guard the eggs their own eggs until they hatch and continue to guard them for up to two years after hatching with other females. Both the male and female crocodile can be a part in the hatching process that involves gently cracking the egg open with their tongue and upper palate. After this hatching process, the baby crocodiles is carried to the water. The female crocodile, during the breeding period, must regularly leave the nest to cool off in the water which puts their nests at high risk. Predators such as lizards, hyenas and even humans use this opportunity to take the eggs. There is not a lot of information about the behavior of crocodiles, however, they are considered to be social crocodiles which means that the common phrase ‘sharing is caring’ can be used to describe the way of life of for the Nile crocodile. The cooperative nature of the Nile Crocodile is evident in the sharing of lounging spots and their large food sources/spots with each other. There is however a tendency in which the crocodiles that are bigger in size, and thus at the top of the hierarchy, have primary access to these spots. They are also known to scavenge from carcasses with other animals that they are able to tolerate. Along with their aggressive reputation in the animal world, they are known as being man-eaters to also be responsible for hundreds of human deaths yearly. Evidence has indicated that they have probably killed more people than all other crocodilian species combined. This is not to suggest that humans form part of their daily diet. 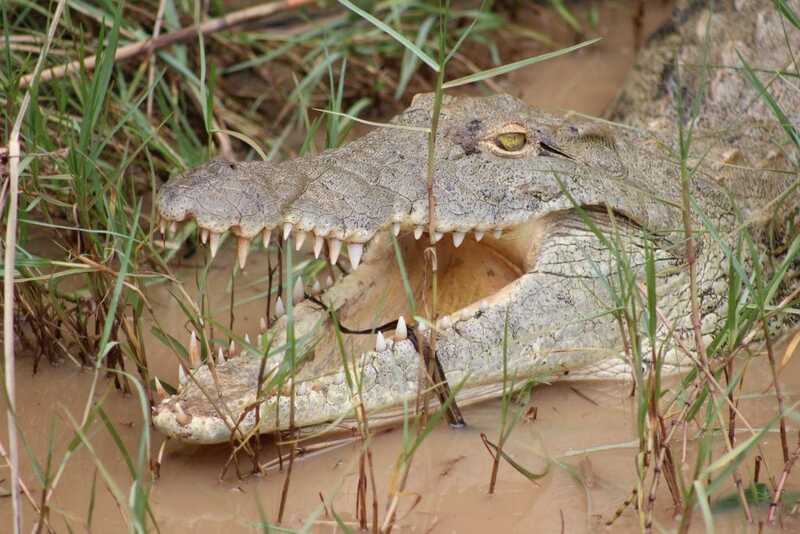 Crocodile experts have recorded that the bite of the crocodile exerts a force that is eight times stronger than that of a Great White shark. They have a bar force of about 22 kn (Newtons). The level of protection during the breeding period does not translate necessarily translate into feeding their hatch-lings, in most instances the baby crocodiles are thrown into the animal world and learn to hunt for themselves. St Lucia also happens to have the largest free roaming Hippo Population in South Africa estimated at 800 animals. These two species are encountered on a daily basis both on the banks and in the St Lucia Estuary. Hippos do roam the streets at night which becomes quite adventurous should you be overnighting in the town of St Lucia. St was proclaimed as South Africa's very first world heritage site in 1999 by Unesco. This quaint village surprises many a visitor due to the wonderful and interesting abundance of wildlife. St Lucia is also a mere 45 minutes from KwaZulu Natal's iconic game reserve the Hluhluwe-Imfolozi Park, ideal for some Big 5 Safaris.